Why See Delusion: The Blue Blade? ANOTHER must see FROM JON BRAVER! Present Day. Los Angeles. The world has become erratic since the theft of the Blue Blade; an artifact of unknown origin rumored to give its owner the power to tear through the fabric of space and time. Once held by the Safeguard Society, an elite group of historians, the blade was stolen by Professor Evelyn Lowell... one of their own. Evelyn went underground and unlocked the mysteries of the blade. For years she ran a black market, amassing wealth by taking clients to other eras. But as prying eyes grew hear, she disappeared. Rumored to be protected by a shadowy cult. The fate of time and space hang in the balance as Evelyn and the blade slip further away. As a sign of desperation, the Safeguard Society look to you, their most promising initiates, to track down Evelyn and the blade. There have been no leads. Until tonight." Sound good to you? 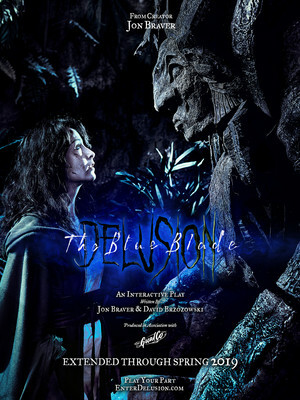 Share this page on social media and let your friends know about Delusion: The Blue Blade at Cafe Fais Do Do. Please note: The term Cafe Fais Do Do and/or Delusion: The Blue Blade as well as all associated graphics, logos, and/or other trademarks, tradenames or copyrights are the property of the Cafe Fais Do Do and/or Delusion: The Blue Blade and are used herein for factual descriptive purposes only. We are in no way associated with or authorized by the Cafe Fais Do Do and/or Delusion: The Blue Blade and neither that entity nor any of its affiliates have licensed or endorsed us to sell tickets, goods and or services in conjunction with their events.